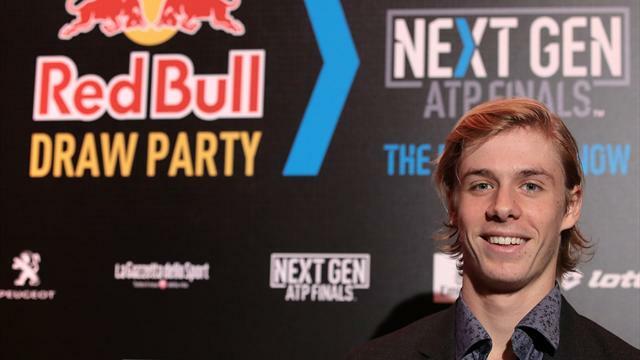 The ATP's flagship tournament for the world's top players aged 21 and under launches in Milan on Tuesday with a raft of new innovations that might leave regular fans scratching their heads. Like the following week's ATP Finals in London, the tournament will feature two groups of four with round-robin action followed by semi-finals and the final. All matches will be best-of-five-sets but with sets played up to four games with a tiebreak at 3-3. Sudden-death deuce points will add to the drama while on-court shot clocks will keep matches rattling along at a fast pace with the 25-second rule rigidly enforced by the umpire. There will also be no 'lets' on serve meaning play continues when a serve clips the tape and goes in. Players will also be able to communicate with their coaches via headsets at the end of each set. Fans will also be able to move freely around the stadium during play rather than having to wait until change of ends to enter the stands. The court will have no doubles lines which will also enhance the visual effect for fans in the venue and on TV. Line judges peering down the lines will be absent as computers make the calls. The chair umpire will be the only match official on court with calls of 'out' and 'fault' being made by an "automated" voice. Foot faults will be determined by an off-court official. There will be no Hawkeye reviews - a popular innovation in tennis. WHY ARE THE ATP DOING IT? Chris Kermode, the ATP Executive Chairman and President, said: "We're excited to be bringing something new to the table with this event. The sports and entertainment landscape is changing rapidly, as are the ways in which fans are consuming our sport. This event is not only about the next generation of players, but also about the next generation of fans. "We've created this new tournament precisely to allow us to look at some potential new elements, in a high-profile environment."